A fresh take on the iconic original WPtouch theme. Classic has been re-designed and re-engineered for the modern mobile web. Structured content layouts and powerful header navigation make Classic one of our most popular themes. Customize Classic with your own colors and type, and personalize its iconic mobile web design. Flexible options and support for nearly all of WPtouch’s features, Classic is truly timeless. Classic defined the standard for mobile WordPress websites. No other mobile solution has had more impact on mobile design for WordPress than WPtouch & its Classic theme. Flexible options to show tags, categories, menus, and search. Classic's header morphs automatically depending on the colors you choose in the Customizer. WPtouch menus support hierarchy, WordPress custom menus, and the ability to assign icons to menu items. WPtouch Pro 4 themes support visual, real-time editing in the WordPress Customizer. Tinker, adjust and preview your changes in real-time. Well-organized settings allow you to discover all of your theme's capabilities easily. Easily switch between portrait and landscape views, and in tablet-supporting themes, see how themes responsively adapt. Extensions like Advanced Type and Related Posts add Customizer settings enhancing your control. All themes include deep WordPress integration, and support for all WPtouch extensions. WPtouch supports using custom WordPress menus, and adds the ability to associate icons with menu items. 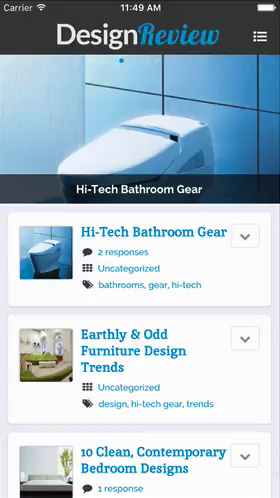 You can activate custom posts types to be shown within WPtouch. WPtouch can attempt to locate shortcodes used in your desktop theme and display them. Want to use a special template for a page in WordPress? Just like desktop themes, you can apply a mobile template. WPtouch displays posts and page content automatically with zero configuration. Categories, tags, custom taxonomy— WPtouch themes can display it all. Enjoy regular product, theme and extension updates within WordPress, and the plugin itself. Most themes support all native discussion features. Get more out of themes by adding extensions to your license. Extensions enhance themes in specific ways. Want to customize a theme? Easily create a child theme and start modifying style & template code. WPtouch can redirect users to a difference front page and posts page if you wish. Choose to include or exclude WPtouch from showing on URLs on your website. Enable or disable mobile browsers and devices by type easily. All themes offer the ability for visitors to switch between your mobile and desktop theme. Speed up load times by unloading non-essential 3rd party plugins on mobile. WPtouch automatically handles the mobile-sized display of video and photos on your website.